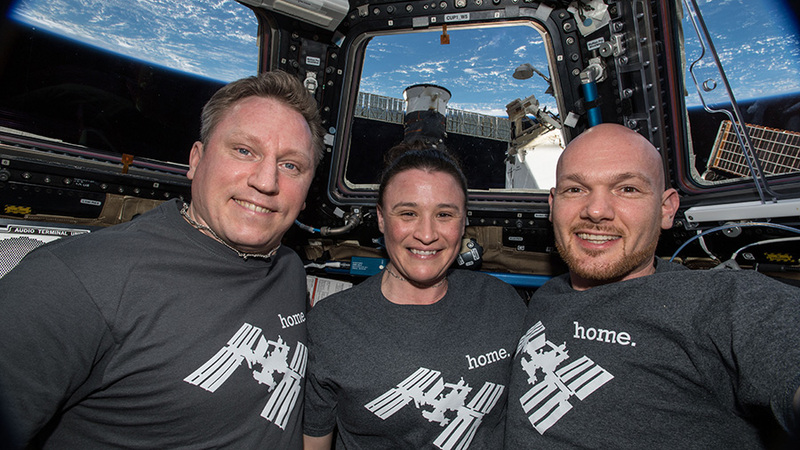 The three Expedition 57 crew members are gathered inside the cupola, the International Space Station’s “window to the world,” for a portrait wearing t-shirts displaying their home in space. From left are Sergey Prokopyev of Roscosmos, Serena Auñón-Chancellor of NASA and Alexander Gerst of ESA (European Space Agency). The space station was orbiting nearly 253 miles above the Solomon Islands in the South Pacific Ocean. The three Expedition 57 crew members living aboard the International Space Station today explored a variety of phenomena impacted by exposure to microgravity. In Houston, NASA astronaut Nick Hague talked about his Soyuz contingency landing after last week’s failed ascent to orbit. The commander, Alexander Gerst of ESA (European Space Agency), put on his plumber’s cap in the morning for maintenance on the orbital lab’s toilet. The German astronaut then spent the afternoon working on gear inside the Destiny lab module before updating a warning procedures book. In the Russian segment of the orbital lab, cosmonaut Sergey Prokopyev split his time between physics and human research. The flight engineer started the day exploring how forces such as exercising or spacecraft dockings impact the station’s structure. He then participated in a study observing interactions between a space crew and Mission Control in Moscow. It is soooo glad Astro Nick Hague is home with his family and God Bless him and his family and the entire Expedition 57-58 and Take care! !